Aberdeen Grammar will contest the National League Cup final against Highland RFC on Saturday 20 April 2019 at Stirling County’s ground at Bridgehaugh. The game will kick off at 3 pm. 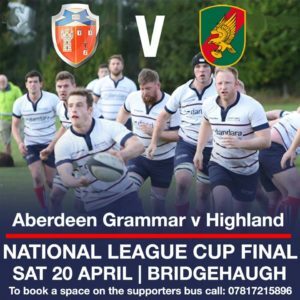 Prior to this, our 2XV will play a Caledonia North League 2 fixture against Highland RFC, also at Bridgehaugh with a 1 pm kick off. All Club and player sponsors are invited to lunch and refreshments in the Club Centre prior to the match against Hamilton on 16 March 2019. A final release of tickets for the Guinness Six Nations game Scotland v Ireland at BT Murrayfield (Saturday 9 February, kick-off 3pm) will be available to purchase online from 10am this Thursday 17 January. We’re all very proud of Louise, our club doctor, who took part in series 4 of SAS: Who Dares Wins. Follow her journey on the show every Sunday night at 9pm on Channel 4. The first episode can be found on iPlayer. The SRU have announced the upcoming sale of individual tickets for the game against Wales on Saturday 9 March 2019.